Thursday means it is time for another Weekly Challenge. This week Selma and I want to show you how to create a small gift box with a band. This style box is called "Mini Pizza Box". 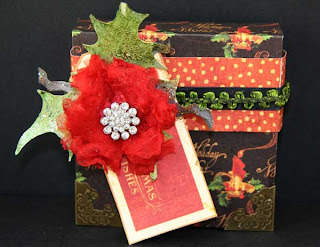 There are tutorials on how to create this box at SCS and also Sherry Cheever has a video. The measurements on our boxes are the same as these, but Selma has created a little different technique that you can read about here! I used the 12x12 Graphic 45 Christmas Emporium Paper along with one of the tags from the same paper pack. Tim Holtz Corners were added to the box for more interest and texture. A flower was made using Organza fabric (instructions were posted here) and the new Holly Die by Tim Holtz is the base for the flower. Crackled paint and clear Stickles added dimension to the leaves and branch. So much potential with this new die. A ban was made with a contrasting paper from the Graphic 45 paper pack. A black strip of paper centers the middle and a piece of green trim was attached to the top of it. All products are available from Joan's Gardens. ■ Decorate the pull off band. You will have until next Thursday (November 10 ) morning 6:00 AM EST to link your project. You can enter more than once. A winner will be chosen from the Random Drawing for week #9 challenge and will be announced Friday November 4th. This winner will win a Graphic 45 Stamp. The winner will also be entered in the end of the year $100 gift certificate drawing. 3. Or if you are posting to the SCS gallery, you will need to use a special code to tag your card to the challenge. This week's code is JG1103 and needs to be posted with the challenge. LOVE yours and Selma's boxes! I can't wait to give it a try. I don't have Christmas Graphic 45 paper but I do have other Christmas paper. Thanks for such a fun challenge! Fun challenge, Joan! Your box, and Selma's, are gorgeous! Sorry, but I didn't have any full sheets of Graphic 45 paper left so I had to sub there. Thanks for the inspiration! Love the boxes from you and Selma. Thanks to her for the great directions. Had so much fun that I came back with another entries. All the posted entries are wonderful.